If there is one thing that has always annoyed Iain P W Robertson beyond infuriation, it lies in the motor industry’s perpetual insistence that certain types of vehicle can command ridiculous and unwarranted premium price tags. There was a time, in the dim and distant past, when a 4×4 was a farm vehicle. While there existed a minor element, a teensy chink, of the great British motoring public that desired a fun aspect and would insist on conducting their 4x4s through mud-splashes, up-hill and down-dale, through rivers and all while wearing waterproof, ex-Army surplus clothing, these vehicles still had their place. Along came the Range Rover, in 1970. It cost a cool £2,000 then. In fact, I bought my example in 1977, for an equally cool £1,400, which I then proceeded to drive into the town’s shopping precinct and down the steps to our local, making all pub visitors squeeze uncomfortably and complainingly betwixt fenders and brick walls to gain access. Nobody was as bothered about DD and automotive derring-do then…well, not so much as you might notice, anyway. It is the Rangey that must shoulder the blame and, while you can add two noughts to what I paid for my unsophisticated, 4-speed gearbox, wallowy-suspended, all-white, R-reg, pseudo cop-car, in order to buy the latest long-wheelbase luxo-barge from the Indian-owned takeaway specialist, it is its ever-broadening appeal to the nation’s ‘yahoos’, bankers and short-of-stature entrepreneurs that has whisked its two-tonne glory into the realms of ‘supercar’ desirability. Oh, sure. A pair of hand-tooled Purdeys would not look out of place spread-eagled on the load deck’s finest Wilton and champagne spillages onto Nappa hide and Chippendale’s planks are just the by-product of a spoilt childhood. However, no agricultural vehicle, no matter how sophisticated it might be purported to be, can be justified truly on the bottom-line invoice front. Rangies are now stupendously and horrendously over-egged. Their omelettes are really over-cooked. Weigh-in the farmer’s friend. 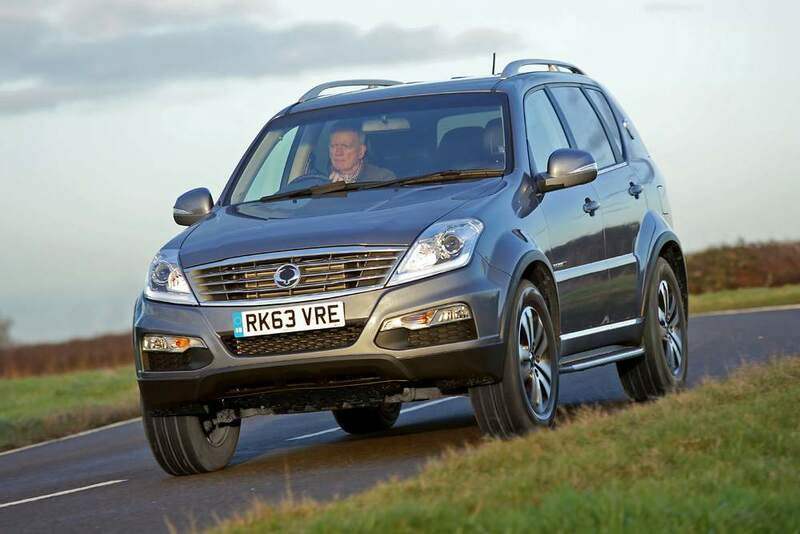 Despite being unpronounceable by well-meaning British scholars, Ssangyong (count the Gs, let alone the Ss) is the pluperfect 4×4. Estimably inexpensive. Eminently practical. It is the real-ale and pork pie follow-on from ground trodden on by countless snooty Rangies and their rivals. This is a Korean but Indian-owned (just like the Rangie) producer of go-anywhere, semi-agricultural vehicles that deliver the all-wheel-drive experience from an altogether more affordable and more realistic base. Let’s face it, traversing rock faces, barrelling up rift valleys and scaring mountain goats are not the practices to be exercised by today’s Rangie drivers, who do not really want to scratch the hand-polished flanks of the Sport model so kindly acquired by daddy for little Rupes, Cadenza, or Zarathustra. Besides, mumsy would go ape. Haring around our extremely private test venue (Grange Farm, Wittering Grange, just off the A1, near Peterborough) in the latest Ssangyong Rexton W, I can tell you that I felt no loss of value, or quality, or competence, from the equivalent Land Rover model, although in acquiring one, I would be saving several thousands of Pounds, thus depriving HM Revenue from its hefty share, while also causing the ether to shrink somewhat from a reduced depreciation loss, as it is abundantly clear to me that it is into the atmosphere that value losses waft away. Yet, here is the rub. 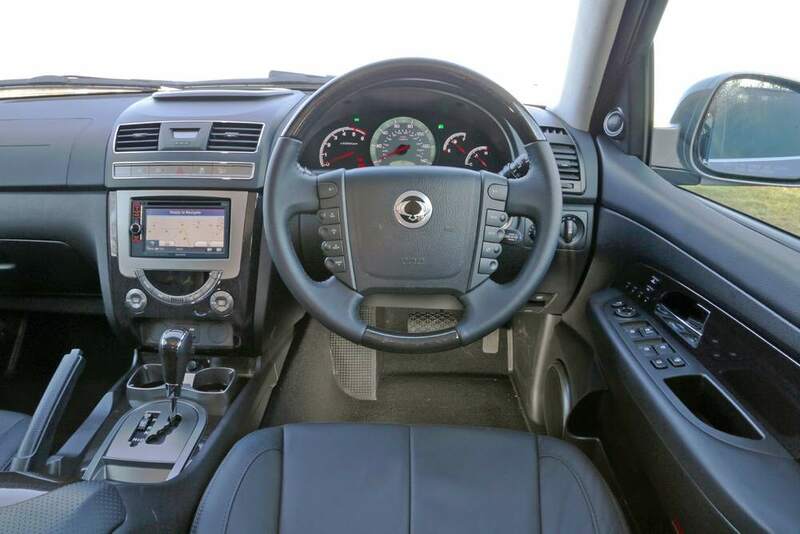 Even when the going is tough (and, believe me, it was treacherous underfoot at ‘the Farm’), the Ssangyong rewards its driver with identical levels of traction and tractability that come from its near seven-times pricier Solihull-built competitor. In fact, conducted properly on the most tricky of surfaces, wading through half a metre’s depth of cloying mud, ‘walking’ across rocky outcroppings and slip-sliding along hilly traverses, my meagre funds would be invested in the Rexton and not squandered on the Porsche-baiting Rangie. This is tortoise and hare territory, where the tortoise always wins. However, extend its legs on the open highway and the Rexton covers ground with every bit as much confidence as the higher-price alternative, even though overtaking with a 152bhp 2.0-litre petrol unit does take slightly longer than with a 5.0-litre V8 supercharged one. 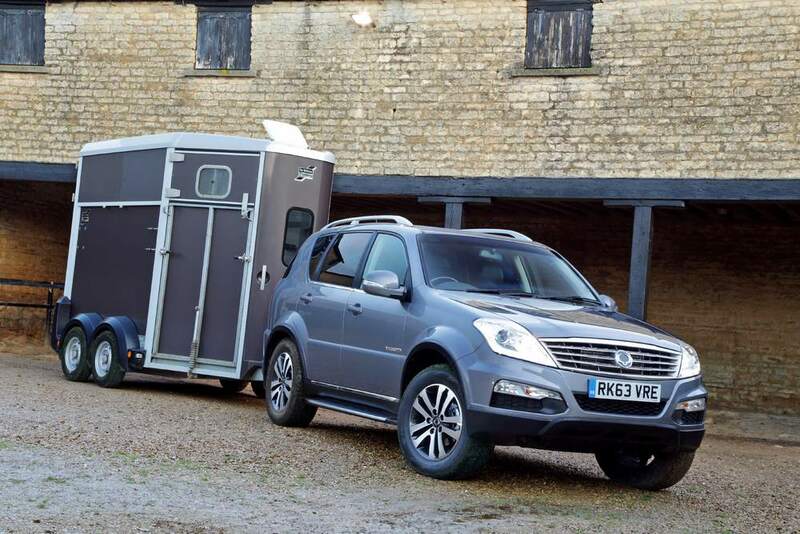 Stick a towbar on either and the Rexton will still give a great account of itself, thanks to an outstanding 266lbs ft of torque (the ‘twist’ energy that enables up to 2.8 tonnes of trailer to be hauled behind it). 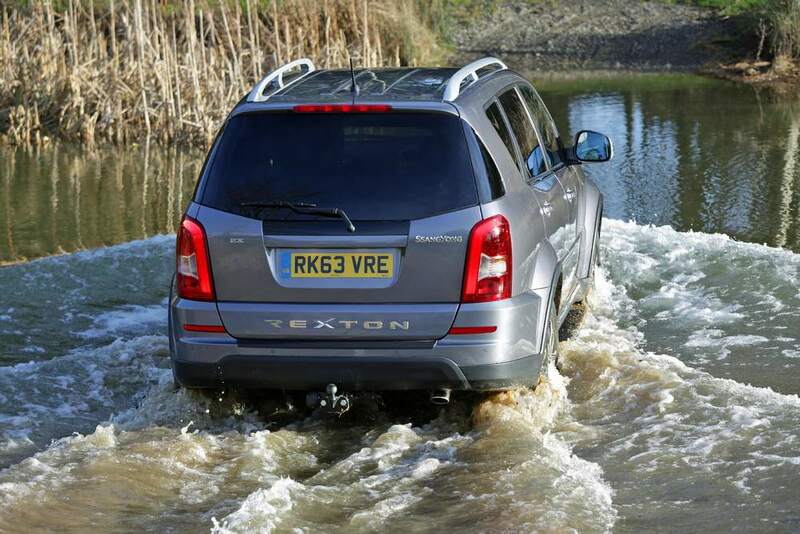 Consider that, at £21,995, the Rexton is a handsome, stylish even, seven-seater carrying a five years no-quibble warranty and you would be half-daft not to buy one for your farm. The bottom-line is that I have always liked the Ssangyong Rexton, even before it gained the latest ‘Worldwide’ soubriquet of ‘W’. My only argument was that it needed to be tidied-up a touch and it is abundantly clear that the company was listening to me, because its new ‘soft-touch’ dashboard, Tom-Tom sat-nav, Merc auto-transmission (6-speed manual is available), hide-swathed chairs and decent on and off-road manners have turned it into the shapely bargain that it is, make no mistake. Conclusion: Poor old Ssangyong. It had been through hell and high water before finding Indian ownership, which sort of appeals to it, fortunately. The Rexton looks great on its shiny alloys and it is more than Tonka Toy enough to handle the rough and tumble of a hard working life. Its greatest attraction is its fully-loaded specification but not accompanied by a matching price sticker.